Well, as if I didn’t have enough to do these days, yesterday I managed to lock myself out of my house. Monday not being one of my regular work days (I work part-time at the moment), I had a leisurely morning in, eventually toddling around to the corner shop (Pontcanna Stores) to buy a newspaper and use the Post Office (which is inside the store) to send some correspondence overseas. I locked the front door as I left the house, which I always do. The door is fitted with a dead lock so it can be neither locked nor unlocked without using the key. That means I can’t lock myself out by leaving the key inside the house. However, returning back to my house, I attempted to open the lock with my key only to find, to my dismay, that, although the cylinder within the lock seemed to rotate correctly, the door didn’t unlock. I tried dozens of times to no avail. I was stuck outside with no obvious way to get into the house. I didn’t have access to any tools, and didn’t have my phone either so I was at a loss to know what to do. Eventually I decided to return to the shop to ask if I could use a phone to call a locksmith. Looking at the lock it after removing it from its door it became obvious what had happened. Something had gone wrong with the mechanism inside the lock which meant that, although the key rotated the action, it didn’t engage the bolt fully which resulted in the bolt not being properly withdrawn from the rebate on the hinge. It’s an old lock so it was probably just internal wear and tear, and, the likelihood being that it would recur every time I used it, I had no choice but to remove the lock so I could try to find a replacement. There is another lock on the door, so it would be fairly secure until I fitted another dead lock, the old dead lock being dead. Mike suggested I take it to the local hardware shop to find another lock that matched. I did so but he didn’t have an exact fit. Also I had – stupidly – omitted to take the plate from the front of the lock which had the name of the manufacturer written on it. He offered to sell me a new lock (c. £15) and fit it for £20. That seemed a pretty good deal, but he did suggest trying a specialist shop (not far from where I work). Putting a replacement lock into the space vacated by removal of the old one would be much easier than cutting a bigger hole in the door to hold a lock of different size. 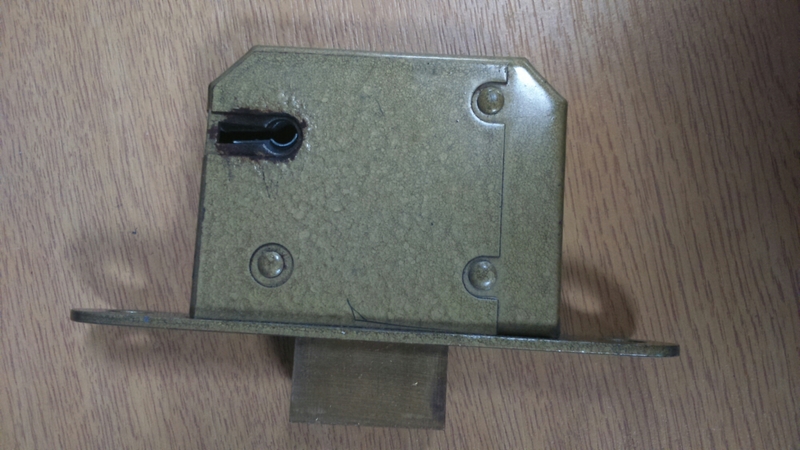 The man in Cardiff Lock and Safe Co Ltd managed to identify an identical lock but didn’t have one in stock. He ordered one that I can collect tomorrow, and I should be able to mend it then. I’m posting this not so much because of the little crisis about the dead lock, but to say thanks to all those who helped me out yesterday. It makes a big difference living in a friendly community where people help each other out. Sadly, though, Mr Patel is selling up the business he has owned for over 30 years and it is being taken over by the Coop as yet another mini supermarket.